In 2007, life skills teacher extraordinaire, Melissa DeStefano, brought Special Olympics to Pottsgrove High School. Then in 2013, she co-founded Falcon Friends, a PGHS organization that pairs regular education students with those who have special needs. 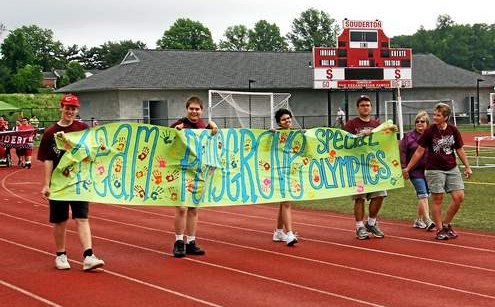 On May 18, Special Olympics will again take place at Souderton Area High School. She accomplished all this while battling Multiple Sclerosis. For all of these reasons, Melissa DeStefano is an unsung hero. Originally from Cadillac, Michigan, Melissa moved to Pennsylvania in 1983. She graduated from Boyertown High School, went on to college, got her first teaching job with PGSD in 1990 and never left. She has two teenagers who go to school in the Boyertown Area School District. While teaching, she earned her Master’s degree from West Chester University. Eight years ago, Melissa DeStefano approached the school district’s administration with the hope of having her students participate in Montgomery County’s Special Olympics. The district said yes. Her athletes have enthusiastically returned each year since, earning bundles of well-deserved awards and fond memories. Melissa’s spirited special education students, with intellectual and developmental disabilities, some in wheelchairs, earnestly participate in events such as running, throwing and jumping. Next week, after months of training, Melissa’s athletes will once again return to Special Olympics, a day filled with challenge and delight for everyone involved. They will be joined by students from Pottsgrove’s middle and elementary schools. Each athlete is teamed with one or more nondisabled helpers known as buddies. These valiant buddies provide support, encouragement and make sure that athletes arrive at each event on time. Further, Melissa saw the striking benefit for her students of more frequent opportunities to interact socially with nondelayed peers. Building on the success of Special Olympics, Falcon Friends was born in 2013. Melissa teamed up with fellow teacher Kristen Uhas and, after two years, Falcon Friends is still going strong. “Our final activity of the year is to have the Falcon Friends come to Special Olympics to be on the field with our students. It is so rewarding to watch their relationships grow during the school year, and to watch them hug their buddies and to give pats on the back and high fives at the end of the day,” said Melissa while flashing her trademark smile. “Many students say that their time with their Falcon Friends is the best part of their Pottsgrove careers,” Melissa added. One student changed her degree to special education because of her time with her buddy. She saw how much joy Melissa brought to her students’ lives and wanted to do the same. Importantly, Melissa serves on the Board of Directors for a non-profit organization called Happy 2 be Home, which helps to fund home renovation projects for families to keep their medically fragile and/or physically handicapped children at home. Melissa DeStefano lives by the motto of Special Olympics: “Let me win, but if I cannot win, let me be brave in the attempt.” Visit Melissa’s website: www.melssupportsquad.com, where she raises funds and the level of awareness for Multiple Sclerosis.